Often times there comes along a book in one’s life, where you relate so well to the characters and plot that you wonder if the book was written solely for you (also the main character having the same first name as you, and same blog name as you helps too). This was the case for me when I read Page by Paige today. I finished the whole thing in under an hour because I fell so deeply in love with the story and all the characters within it. 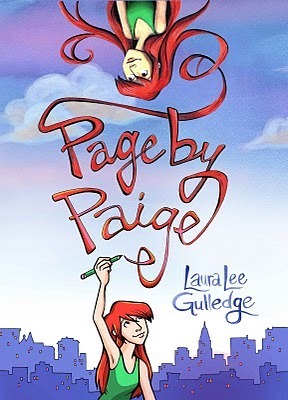 Lately I have been getting into a lot of graphic novels, and Page by Paige has become one of my all-time favorites. Not only is the writing effortless and easy to read, but the drawings themselves are simply fabulous. There is something especially unique in the way that Paige’s personal drawings are different from the one’s that are explaining the scene. I really like that the author didn’t limit herself in any capacity and went above and beyond with the illustrations. I can’t wait to purchase this and have it on my shelves, to pick up whenever I feel like it. And the author has one other book that I’ve already put on hold at the library as well so I can’t wait to check that one out too! This one looks adorable! How serendipitous to have a main character named “Paige Turner” 🙂 I absolutely love that feeling you get when it seems like a book is speaking straight to you. Yes! It was a very surreal (and generally awesome) moment! 🙂 Thanks for the comment!